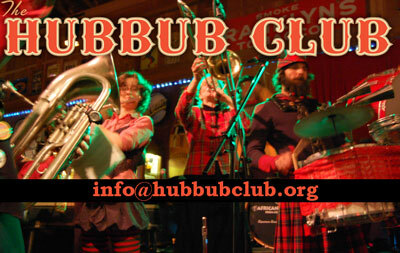 The Hubbub Club is available to play at events ranging from private parties to parades, in almost any venue you can think of. Because we’re a large band, it’s best to make requests two or three months beforehand. Expect to wait several weeks for a final commitment. We ask for $0 to $2,000, depending on the details of your event. For grassroots events that benefit the community in some way, such as arts celebrations, we often play for a small honorarium of $100 to $200.